Dollhouse and miniature collectors each have their own favorite style or brand of pint-sized reality to purchase and display, but no brand of dollhouse has been as successful and achieved such longevity as Lundby. Children of generations past were overjoyed with the detail and the realism of the houses, which among their many attributes were likely the first to feature electric lights. The Swedish company began warming the hearts of little girls with their finely detailed creations in 1947, when Grete and Axel Thomsen from the small village of Lundby turned an enjoyable hobby into an international success story. Grete Thomsen discovered she was very adept at working with her hands when she crafted her first piece of miniature furniture for a niece. She designed a living room armchair and upholstered the piece with scrap fabric from a colorful old curtain. Her husband Axel was so enamored with the little chair that he approached the owner of the local department store about selling his wife's creations. The Gothenburg, Sweden store owner, Ferdinand Lundquist saw a potential for profit with the Thomsen miniatures and began offering them for sale at his store. Little girls saved their coins to buy the dollhouse furniture, which soon began flying off the shelf. Due to the unexpected demand and bulging stack of orders, the Thomsen family moved their production area from the basement of their home in Lundby to a larger space in the town of Lerum. The family business continued to grow until June of 1950 when their workshop was destroyed by a fire. Luckily for Grete and Axel, one of the few items not burnt by flames or soaked by water was a stack of unfilled orders. The resilient couple gathered new supplies and utilized several temporary work spaces in the city to fill the orders of eagerly awaiting children and a growing number of adult collectors. The Thomsen's were plagued by bad luck when they were victims of yet another fire in 1959. The factory they were working out of in the town of Lerro was destroyed; turning many of their nearly completed projects and supplies to charred rubble. A silver lining emerged when the owner of the building, a widely known home interior designer, stepped forward to lend both a hand and his wallet. Axel and Grete offered the designer a partnership in the company and 35,000 1:15 to 1:18 scale dollhouses were created by 1967. Lundby became a well recognized name in miniatures throughout Europe. By the next decade children in 20 countries were adding the detailed dollhouses and furniture to their Christmas lists. The company expanded production to factories in 11 countries and began creating nearly 100,000 houses per year. Unfortunately for the dollhouse makers, children in the late 1970s became enamored with the glut of new electronic toys on the market. Sales leveled out as the company expanded abroad in the 1980s. In an attempt to prevent a crisis created by over-expansion, Lundby was sold to Stefan Karlsten, a local businessman. 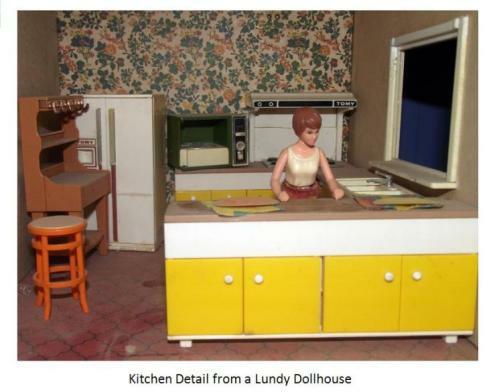 Production of the Lundby furniture and dollhouses was moved to Hong Kong to capitalize on cheap labor and supplies. Although the move aided the company financially in the short-term, in 1983 Lundby filed for bankruptcy. The Swedish government threw Lundby a life preserver in the form of operating capital in 1984 and production resumed. A factory opened in Gothenburg with Lundby acquiring A. Barton Toys, Plasty GmbH, and Lisa of Denmark toy companies. The expansion prompted a new line of miniature accessories, furniture and dolls. The momentum gained during the mid-1980s did not last for very long. In 1993 the Lundby company was purchased by Scanbox, a Danish toy company which was a branch of the BRIO corporation. Before the Lundby company disbanded, the Vanersborg Museum purchased a complete dollhouse set from each era of the company to display. In 1997 Micki Leksaker bought the rights to build Lundby dollhouses and miniatures. After two years of preparation, furniture and dollhouses once again began rolling off the production line. The classic Gothenburg and companion line of furniture became a popular model with both young girls and mothers who once played with Lundby miniatures as a child. The first new design was unveiled in Stockholm in 2005. The dollhouse retained the asymmetrical style of the 1960s Gothenburg but featured modern furniture and was renamed Smaland. Leksaker also created the Lundby "Doll Cottage" with matching accessories and furniture designed by Swedish home interior architects. The Gotland cottage manufactured in 2008 resembles an IKEA showroom complete with a vibrant fireplace and sleek furnishings. Before clicking "Buy it now" on eBay or at a live auction, make sure you know the age and worth of the Lundby dollhouse. Collectors who are seeking to put together a complete and period accurate home for display or resale should carefully review distinct architectural features of the dollhouse. Each new style of Lundby houses is varied in design and difficult to date without being an absolute expert. Joining the "We Love Lundby" club or similar fan groups will aid in answering your questions about authentic pieces and finding the exact era of the home, replacement parts, furniture, or dolls you are seeking. Back issues or pages from Lundby catalogs can often be found from fan clubs or through an online search engine query. Old Lundby catalogs themselves are very collectible and bring at least a moderate return on your investment, provided they are in at least average condition. 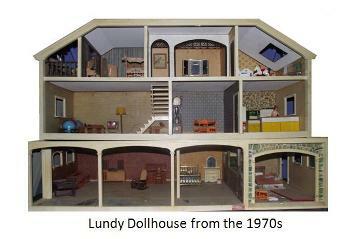 If you are attempting to recreate the Lundby dollhouse of your youth, price and age may not be as much of an issue. It is possible to find many of the same pieces of furniture and accessories from your childhood dollhouse if you search long enough online and are willing to loosen your purse strings. Do not expect to pick up the pieces at the original purchase price. I have found boxes of miscellaneous pieces on eBay from sellers who picked them up at yard sales or when cleaning out a loved ones home. If you are lucky enough to find similar auctions, do not hesitate to buy the box which may hold only one or two of the items you are actually seeking. You can then resell the surplus on eBay or through a Lundby fan forum. I desperately wanted some of the little plastic white hangers which were once inside a closet in my home. I was not willing to pay $15 each for the little gems, but did find them in a box of items that I didn't need for $20 and resold all of the other items at a reasonable price to other Lundby collectors. Finding an electronic transformer which uses an American outlet plug is not impossible, but will take some searching online. Expect to pay at least $60 to bring light to your miniature. The light fixtures themselves all feature the same two-prong end and work in both European and American style Lundby dollhouses. Tara Dodrill is a travel writer focusing primarily on the areas of Florida, the Cape Fear Coast and Ohio. Dodrill's credits include USA Today, Yahoo!, RUMBUM, Cape Fear Coastal Guide, Trips 2 Florida, Gadling, AOL/SEED, Trails.com, Travels.com, Outdoorzy, Hobbizine and BootsnAll Travel Blog. She is also a licensed real estate agent and has been a high school volleyball coach, high school cheerleading coach, softball coach, youth recreation league director, village government council member, county government central committee member, public school drug prevention coordinator, domestic violence shelter board member, Kiwanis club member, vacation bible school teacher and a certified counselor's assistant who completed an internship at a maximum security prison. Tara is also a former newspaper journalist and works as a professional photographer and videographer.